Within the Administrator Dashboard, you will find the Settings and Configuration menu. This is where you will go to modify your system, run reports, and invite users to join your online time sheet system. Add New Project: Module to add new Projects and configure foreman reports, add tasks to the project, assign labor budget. View Projects: Displays a searchable list of all projects where you can turn them to active or inactive. Tasks: Add, view, or modify main list of Tasks. 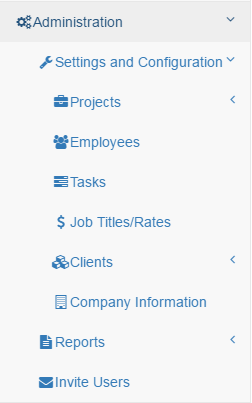 Job Titles/Rates: Add, view, or modify Job Titles/Charge out Rates. Clients: Add, view, or modify main list of Clients. Company Information: Modify your Company information. Payroll Report: Run a payroll report between two dates. Billing Report: Run a billing report between two dates. Project Analysis Report: Displays charts and data pertaining to the costs of the project based on Job title, Rates, and Tasks. Custom Report Generator: Choose which fields you would like in your report and export it into an excel spreadsheet. Within the main Administrator Dashboard is a selection of Administrator Quick links. In here, you will find Employee Invitations, Active Projects and Tasks, Payroll and Billing Reports, Quick view of Employee Time sheets. Use the Administrator Quick links area to jump to some of the most oftem used tasks and pages that an Administrator performs. 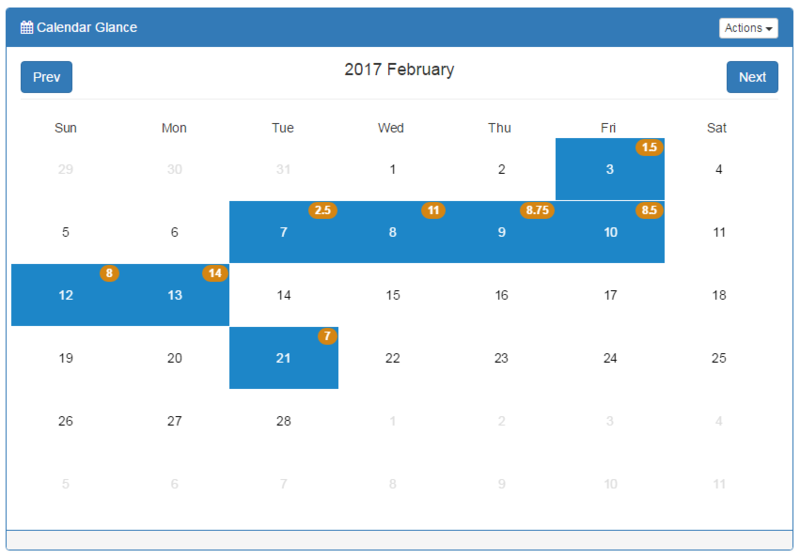 You can look at the current month and see which days you have entered time sheets on. If you click a date on the calendar, it will take you to the time sheet entry page where you can enter a time sheet for that date.